Life has been crazy lately with the antics of our 5 month old, a dog who eats all of the 5 month old’s toys, and a husband on crutches. I’ve never been a fan of recipes that are quick just for the sake of getting in and out of the kitchen (if we’re just filling a void, I’d honestly prefer a frozen pizza or a block of cheese). It’s probably because I love being in the kitchen, but I also truly believe that anything worth doing is worth doing well. And quality tends to be the first thing to go when you’re cutting corners to speed up a recipe. But as a new mom, I finally understand the appeal to simplify dinner time. There are a thousand things that you feel need to get done in a day, and a gourmet dinner isn’t always on the list (but it does rank higher than a shower). The thing is, simplifying can look like a lot of things, and it isn’t just making things faster. It can be prepping vegetables in the morning or putting soup on the stove to simmer throughout the day so the active cooking and cleaning is minimized at dinner time. It can also mean make-ahead desserts that are delicious, but don’t take many pans or a lot of involvement. And this is where panna cotta comes in— one of my dessert heroes. This version is layered over a chunky strawberry jam that’s dressed up with the heat of freshly ground black pepper. The tangy sour cream panna cotta is whipped up in one pot and 10 minutes, then poured over the jam and left to set in the fridge for whenever you want it. It can be eaten pretty easily with one hand, and it looks like a yogurt parfait so there’s no judgment if it turns out to be your breakfast. The panna cotta is velvety, creamy and offset by the crunchy seeds of jammy strawberries. The black pepper is subtle and tastes much more pronounced as the jam is cooking, so don’t panic if it tastes too spicy at first. The sugar of the jam and cream of the panna cotta subdue the heat to a slow warming burn. If you want more heat, don’t hold back and double the pepper to 2 tsp! Moral of the story: just because you’re busy and tired doesn’t mean you have to give up elegant desserts. Enjoy! Toss strawberries, sugar, black pepper, and lemon juice together in a heavy-bottomed saucepan. Macerate for 30 minutes to release juices, stirring once or twice to help sugar dissolve. Heat strawberry mixture on medium-high and bring juices to a boil. Cook, stirring frequently to prevent scorching, until liquid thickens, berries begin to break down and jam turns dark and glossy, 12- 15 minutes. Remove from heat, cool slightly, then divide among five 8 ounce jars (about 1/4 cup each). Pour cold water in a small bowl and sprinkle gelatin powder over the surface. Set aside to absorb the water and soften. Meanwhile, combine heavy whipping cream, sugar, salt and vanilla bean seeds (if using) in a heavy-bottomed saucepan. Heat over medium heat, whisking occasionally, until sugar is dissolved and small bubbles just begin to appear at edges of the cream, about 5 minutes. Remove from heat, stir in softened gelatin until completely dissolved (be careful not to introduce too many air bubbles if using a whisk). 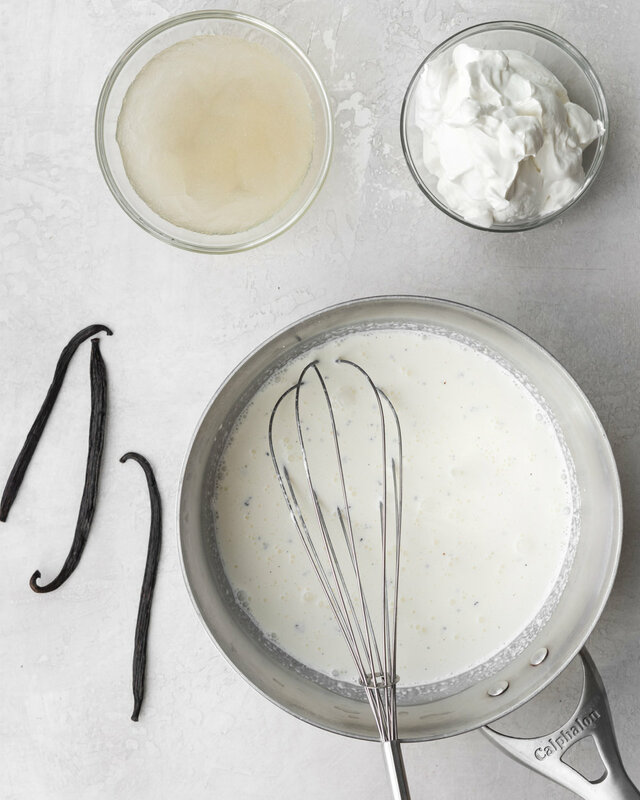 Stir in sour cream and vanilla extract (if using) until well- mixed and no lumps remain. Ladle the mixture into the 5 jars, over the strawberry jam. Cool 5- 10 minutes, cover loosely and refrigerate until set, about 4 hours.